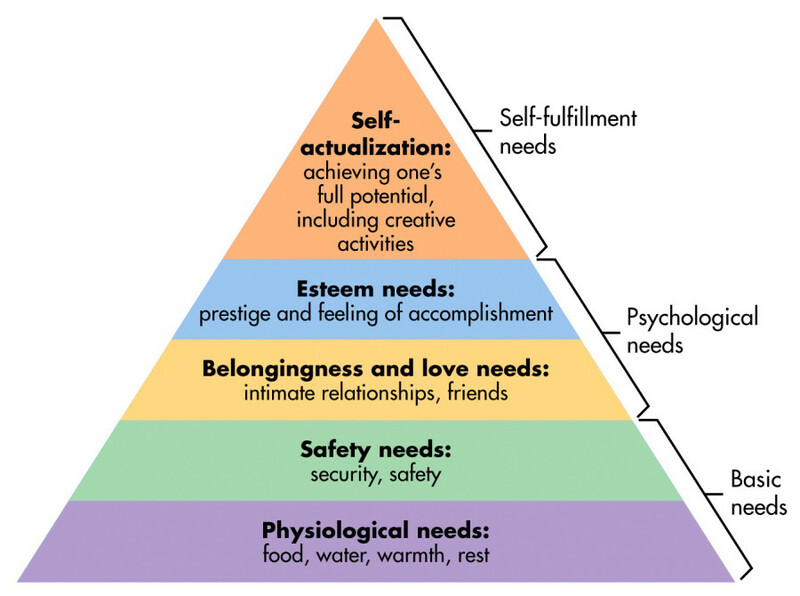 One of the most legendary ideas in the history of psychology is located in an unassuming triangle divided into five sections referred to universally simply as ‘Maslow’s Pyramid of Needs’. This profoundly influential pyramid first saw the world in an academic journal in the United States in 1943, where it was crudely drawn in black and white and surrounded by dense and jargon-rich text. It has since become a mainstay of psychological analyses, business presentations and online lectures – and grown ever more colourful and emphatic in the process. The pyramid was the work of a thirty-five year old Jewish psychologist of Russian origins called Abraham Maslow, who had been looking, since the start of his professional career, for nothing less than the meaning of life. No longer part of the close-knit orthodox family of his youth, Maslow wanted to find out what could make life purposeful for people (himself included) in modern-day America, a country where the pursuit of money and fame seemed to have eclipsed any more interior or authentic aspirations. He saw psychology as the discipline that would enable him to answer the yearnings and questions that people had once taken to religion. Part of the reason why the description of these needs, laid out in pyramid-form, has proved so persuasive is their capacity to capture, with elemental simplicity, a profound structural truth about human existence. Maslow was putting his finger, with unusual deftness and precision, on a set of answers to very large questions that tend to confuse and perplex us viciously, particularly when we are young, namely: What are we really after? What do we long for? And how do we arrange our priorities and give due regard for the different and competing claims we have on our attention? Maslow was reminding us with artistic concision of the shape of an ideal well-lived life, proposing at once that we cannot live by our spiritual callings alone, but also that it cannot be right to remain focused only on the material either. We need, to be whole, both the material and the spiritual realms to be attended to, the base lending support while the summit offers upward direction and definition. Maslow was rebutting calls from two sorts of zealots: firstly, over-ardent spiritual types who might urge us to forget entirely about money, housing, a good insurance policy and enough to pay for lunch. But he was also fighting against extreme hard-nosed pragmatists who might imply that life was simply a brute process of putting food on the table and going to the office. Both camps had – for Maslow – misunderstood the complexity of the human animal. Unlike other creatures, we truly are multifaceted, called at once to unfurl our soul according to its inner destiny – and to make sure we can pay the bills at the end of the month. Operating at the heyday of American capitalism, Maslow was interestingly ambivalent about business. He was awed by the material resources of large corporations around him but at the same time he lamented that almost all their economic activity was – unfairly and bizarrely – focused on honouring customers’ needs at the bottom of his pyramid. America’s largest companies were helping people to have a roof of their heads, feeding them, moving them around and ensuring they could talk to each other long-distance. But they seemed utterly uninterested in trying to fulfill the essential spiritual appetites defined on the higher slopes of his pyramid. Towards the end of his long life, Maslow expressed a hope that businesses could in time learn to make more of their profits from addressing not only our basic needs but also – and as importantly – our higher spiritual and psychological ones as well. That would be truly enlightened capitalism.